How would you like to use the camera? What is the minimum needed resolution? What is the maximum needed speed (fps)? How long do you like to record? Is the size of the camera important? Is the weight of the camera important? Should the camera be able to resist high G-forces? Should the camera have a MIL-STD certification? Please explain briefly where the camera is going to be used for. You can upload a picture below for a better explanation. Do you need the camera to be customized? 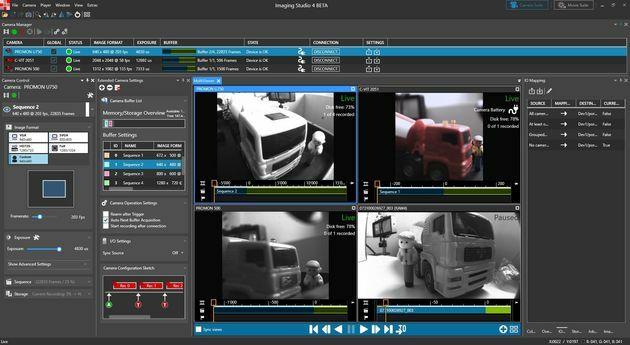 AOS Technologies AG Imaging Studio v4 (AISv4) is an integrated and comprehensive software suite, easy to operate yet powerful. The M-PRI series starts from 1000 fps up to 4000 fps at full resolution. Different memory options for an exactly shaped high speed recording system to meet technical demands and budget. The X-EMA camera underwent an extensive evaluation period with a world renowned military aircraft manufacturer. The camera was mounted in several positions including in the aircraft body and under the wings exposed to the natural environment. The camera was set for multiple sequence recording and with each flight 2-4 sequences have been taken. After the last recording was finished the download to the built in CF card (4 GB) started automatically while the aircraft returned to the base. On arrival of the aircraft the data was already stored in the Compact Flash card. The ground staff connected the Giga Ethernet link to the cameras after arrival and streamed the data to disk. For data security the CF card was removed and stored until the data was transferred to the central archive. We welcome any inputs on projects so we can assist in outlining the best system layout for a specific application. Of course we can always arrange demos on request. AOS Technologies is well known to provide engineering for special turn-key projects. Recently an application with multiple X-MOTION cameras was realized. The purpose was to get a top view at the car to car crash lab. There are three sub-systems, each containing three cameras, a remote controlled lens per camera and one control unit. 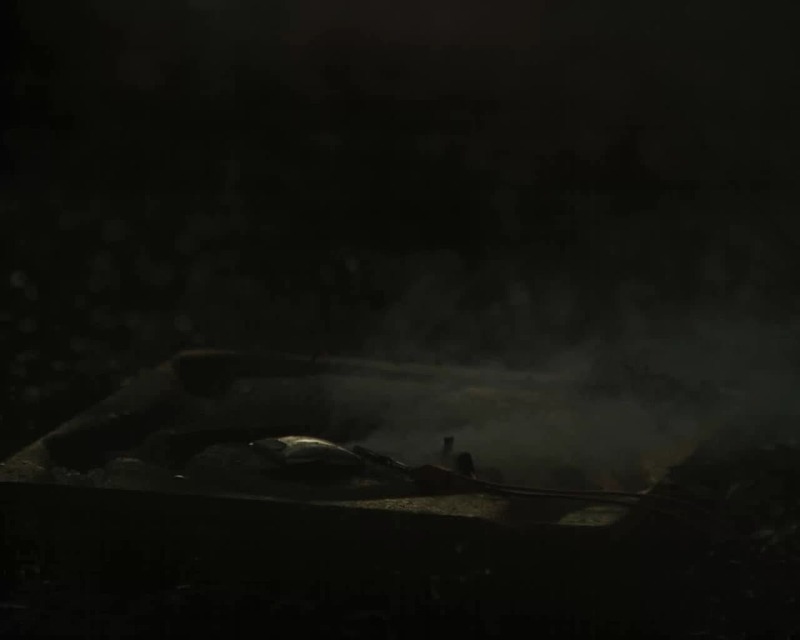 Every camera is fully remote controllable, feeding back “Armed” and “Triggered” signals and receiving “Remote-Switch-On”, “Set-To-Record” and “Trigger” signals. Image data is transferred by Gigabit Ethernet switches embedded in these three control units. The lenses allow adjusting zoom, focus and aperture remotely from the control room, which is 100 meters away from central camera sub-system. All cameras run in frame synchronisation mode. Bottling lines are running at 30,000 bottles per hour or faster. Deviations or failures are not visible with the human eye, nor can they be recorded with conventional cameras. Without seeing the cause of a malfunction, appropriate corrective action can not be taken. Critical process stages as well as single components - in this case bottles, caps, labels and cardboard packages - and in the process line itself, are subject to the risk of disturbing the complete process due to small failures and minor discrepancies. Rejects are reaching an unacceptable and costly level. Process optimization can be difficult; eliminating the cause of malfunctions is pure ‘trial-and-error’. Results are sporadic with shutdowns, increased reject rates, and reduced throughput - cost intensive quality issues. Suitable high speed camera systems have been used occassionally, but usually such systems have been too expensive, and their operation required special skills. A PROMON high speed recording system allows the recording of even the fastest events with up to 1,200 frames per second (fps) and the ability to replay in extreme slow motion. This allows a reliable recording and visualization of high-speed details such as damaged parts, parts outside the specifications or sporadic events which otherwise would not be seen by the human eye or conventional cameras. Analysis of the video sequence makes the formerly invisible visible, and corrective actions can be specified and implemented in short order. The effectivness of these activities can be measured and documented with the high speed camera system. Industrial process analysis is one of the core practices for any successful manufacturing concern, especially breweries and packing plants among many others. High Speed Industrial Cameras are mainly designed to capture events in high speed manufacturing, processing, and packaging environments. These super slow motion cameras are usually placed in industrial settings, like breweries that bottle millions of drinks on a daily basis. The interesting fact here, a high speed industrial camera can stretch one second of video into 10 minutes of playback. Using this ‘slow motion’ data engineers can monitor, analyze, and rectify errors in their industrial processes quickly. Industrial process control and analysis using commercial cameras is now routine practice, but offers low accuracy & success rates. Ordinary cameras are designed to capture images at a maximum of 60 fps, while industrial processes monitoring requires frame rates of close to 1’000 fps or sometimes beyond. 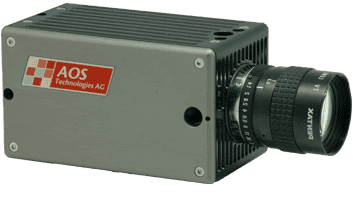 AOS Technologies AG’s leading edge PROMON Camera Systems are designed to cater high speed industrial imaging & video applications. Common system applications include packaging of goods, bottling of drinks, food processing, surface inspection, and product processing settings. 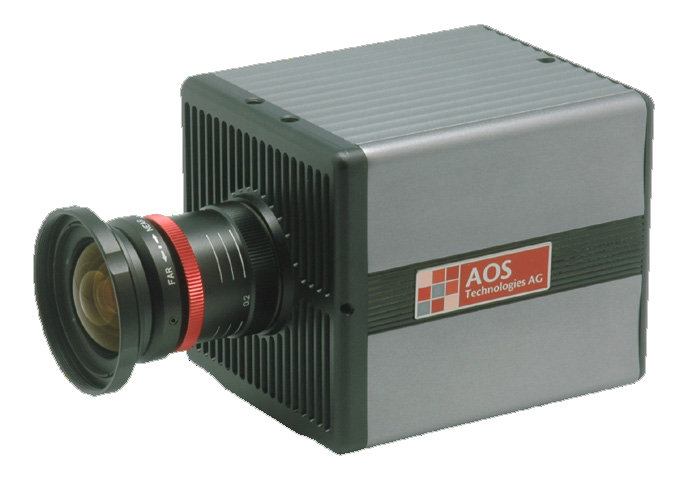 Read more about AOS high speed camera applications here. PROMON High Speed Industrial Cameras are designed with superior HD resolution, accurate triggering, superior frame rates, and no data compression. 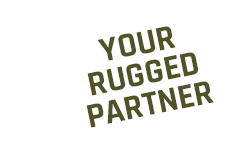 AOS Technologies guarantee that no critical event is ever missed. Thus providing purposeful, swift, and accurate evaluation of industrial events. AOS offers both high speed still cameras, and cutting edge full HD streaming cameras with multiple settings. To view all PROMON Industrial Camera Systems visit our products page. PROMON is a comprehensive industrial monitoring and analysis system, designed for quick & accurate manufacturing process engineering. Manufactured in Switzerland, these High Speed Industrial cameras provide a complete solution with hardware, accessories and software packaged together so you don’t have to put together individual components. 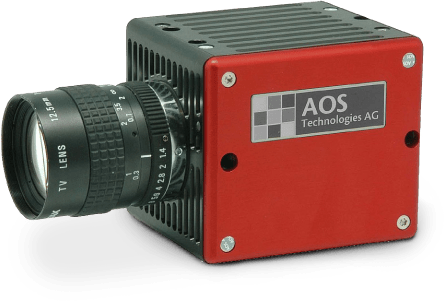 The PROMON High Speed Camera System from AOS Technologies optimizes condition monitoring bringing some excellent economies to your organization. Increase productivity, reduce maintenance times & costs, and minimize process downtimes with a single PROMON System implementation. Reduce discussion times, achieve more flexibility, and economy. Document processes at every stage – even over hours. Trace and Track deviations instantly. Similarly, managing rigorous fast processes actively is essential to any successful industrial setting. Processes must be kept steady, and thoroughly optimized for the benefit of the entire system. This means minimizing downtime’s, while quickly identifying causes of malfunctions and initiating repairs is essential. AOS PROMON System is the best choice for your industry. The AOS PROMON system definitely help you capturing high resolution images at very high speed that will assist you to find production faults, monitoring complex industrial processes and maximizing your production. Airborne high-speed cameras are capable of recording a variety of data during flight tests. This information is provided to you by the manufacturer at no charge. A common application of high speed cameras is incorporating the camera unit into unmanned aerial vehicles (UAVs). Adapting the camera shape and function is essential to capture accurate and comprehensive data. When aerospace high-speed cameras are well-suited for use with other testing equipment. During flight tests, a camera with the right type of aircraft should be used. All aspects of the camera need to be suited for gathering data from the complex systems of individual aircraft. Each aircraft and flight test has unique requirements. In some cases, the camera must be able to capture live video to be viewed in real time. The design of the camera may require connectors to be installed in a separate environment. Other requirements could include the use of the camera, the camera, the camera, the camera, the camera and the camera. Extra housing for attaching the camera to the aircraft makes it easier to integrate. Cameras that are semi-customizable can meet the needs of many different flight testing requirements. Each camera operates similarly, but can perform optimally under the particular environmental conditions. Its aesthetic and practical design makes it possible to fit the camera into its compartments on the aircraft. All of these features are only possible with a high level of flexibility in the design. Interface parts that can be fitted with different connectors. With this approach, the camera is capable of meeting the widest range of requirements for flight tests of different aircraft. These cameras can be easily and efficiently operated during a flight test with smart features that allow for automation. Flight engineers can input the image data and operation settings before the test takes place. The camera then takes the images as designated by these settings without the need for manual control. With this ability to take pre-programmed instructions, these cameras allow for accurate and high-quality data collection involving different angles and conditions on any type of aircraft. Standards for cameras working in a network provide quality control for downloading and preserving image data. The standards, approved by the IRIG, provide specifications for the camera to communicate to the central control unit where downloaded images are received. Specifically when applied to UAVs, cameras must be able to provide clearly visible live feeds to ground stations and thus have the system infrastructure to support a large data transfers. The images captured by the cameras are large files and their downloads have the potential to interfere with the transfer of other data. Smart algorithms implemented in the camera design allow for optimal image data reception without hindering other aspects of the flight test. The ability to synchronize camera video data with other flight test data is essential for accurate analysis – for example, correlating IRIG-B or GPS signals. The recent standardization of a common data format, IRIG-106, has simplified the exchange of different types of data. This common format allows for flexible use of tools to analyze data and better alignment of measurements from each camera used in the test. Flight engineers can better review and compare data collected, spending less time and resources on conversion. Aerospace high-speed cameras provide the flexibility, customization and synchronicity needed for capturing accurate and clear in-flight images. Cameras for both manned and UAV applications are a cost-effective way to complete flight tests, as they are designed to meet the requirements of specific aircraft and environments. MC-Systems was founded in 1991 and was part of MC-S Holding. During this time we supplied and maintained measurement, registration, and analysis systems or solutions for military, space and civil applications.